I have been making this recipe for Perfect Crock Pot Beef Roast or Beef Roast and Veggies for a very long time. When I was a single mom, working full-time, this was one of my “go to” recipes. Back then, I was dubbed the “Queen of the Crock Pot” by my kids. My sister Joan came in a very close second but I had her beat in the blazer department:) I had as many blazers as I did crock-pots, can’t have just one! Every time the kids saw the Crock-pot sitting on the cupboard, they’d groan; “Ahh Mom, Not another crock-pot meal!” Now years later, many of those “crock-pot suppers” are their favorite meals. I never used a recipe when making crock-pot meals nor did I ever write down any of my “made up on the fly” meals. They always had three components; cream of whatever soup, dry onion soup mix and meat. To this day I can’t make a casserole without a can of cream of whatever soup. Most of my “crock-pot suppers” were made with ingredients I had on hand. Many times there was no rhyme nor reason to my madness. I always had plenty of cream of whatever soup and onion soup mix on hand which was usually the base of the recipe. A can of this and a can of that. I would toss everything into the crock pot, turn it on and walked out the door. When I got home from picking the kids up from school after work, supper was ready. All I had to do was dish up supper, sit down at the table and hear all about their day. After a long hot summer filled with grilled meats and picnic foods, the cooler weather is always welcomed. It also signals that it’s time to dig out your crock-pot. Head to the nearest farm market or your favorite farm stand and pick up some fresh produce. Come home and make your favorite meal. Fresh farm produce, your favorite cut of meat, cream of whatever soup and you have the perfect combination for making crock-pot meals! The perfect combination of favorite fall ingredients. Place beef roast in bottom of 5 to 6 quart size crock-pot. Sprinkle dry onion soup mix over roast, spoon on cream of mushroom soup. Add carrots, sprinkle with black pepper. Add peeled whole garlic cloves and as many pearl onions as you like. Add sweet potatoes and whole potatoes. Cover crock-pot and cook on low 6 to 8 hours. 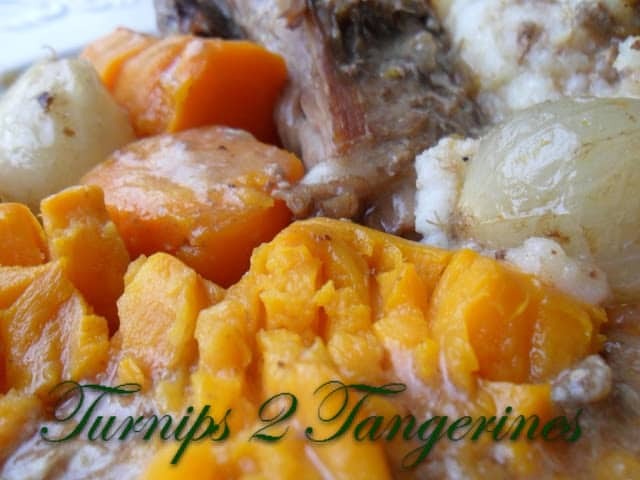 Here is another easy crock pot recipe. 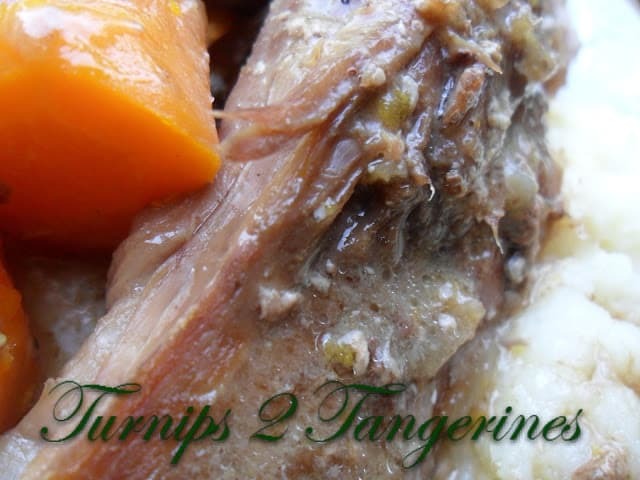 Creamy Pork Roast in Crock Pot. For this recipe, we used Lipton Onion Soup Mix and Campbell’s. This recipe looks so yummy! I will be making this one for sure. Thanks so much for sharing it! I found you via the Aloha Friday Blog Hop. I am now following you via, GFC, G+, bloglovin' and Pinterest. Thanks and enjoy the long weekend! 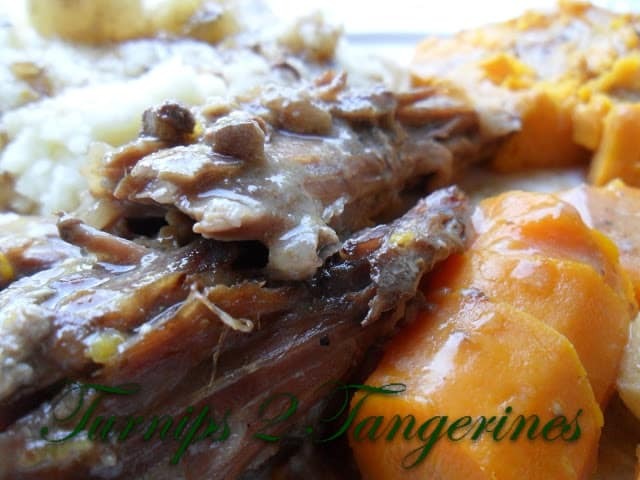 That is pretty much my go to recipe for pot roast but I have never made it with sweet potatoes! What a wonderful idea! I will definitely try that next time, thanks!